We have all heard the story of where hip-hop started and we have all witnessed where it's taken itself and where it's been taken. However, through the convoluted, diluted, redundant with at times spurts of beautiful and honest expression of Hip-hop, Cuba which is in close proximity to the port of Miami, has retained what hip-hop heads in underground and mainstream pockets of the United States are searching for like Lupe Fiasco searching for a release date. Sisters Vanessa and Larissa Diaz who wrote, produced, and edited the film decided that what they witnessed over in Cuba needed to be viewed by the world. Desde el Principio (From the Beginning) displays the true essence of what hip-hop culture and rap music means to the Cuban people. Currently the film is being premiered in communities and universities on the west coast to be followed with a tour that will travel to the east coast. Vanessa lets it be known that this is truly an independent film that was never about the money, but about the message, which in US with the influence of financial gain is slowly fading away. Diaz: This film is very independent we don't have a distributor we've done everything by ourselves. We do screenings at community centers and universities and we are just getting commissioned to go places, and we are kind of running our own pr campaign and it seems to be working pretty well. The good thing is we are getting the right kind of response, we have a lot screening dates so we are not sure when the official premiere is going to take place. MVRemix: What made you decide to do a documentary on Cuban Hip-hop? Diaz: I think for anyone to know what it takes to be inspired by anything having to do with Cuba you just have to go there; because when I was in Cuba I fell in love with the people and being in Cuba helped me appreciate the Cuban way of life, and their dedication to hip-hop, and their creativity, and when you see the film and I think this is in the trailer to, but you can just feel how M-1 from going there he had so much admiration for Cuba and I felt that same way you know. Its like this overwhelming feeling when you see these people and their work ethic and what they have to work with, that's how they make it work and I just didn't want them to be taped and be on film for myself and kept somewhere in my bedroom. I felt like I really needed to share this with people however I could. MVRemix: Do you think Cubans think more about hip-hop as an art and less of as an industry compared to the US, because I think the US even though it started out as art is more industry minded, and from the trailer I saw it seemed that they cared more about what they did? Diaz: Hip-hop is such a big deal in Cuba and the artists there are recognized and well known but the fact that they don't have a market for cd's there; because the average Cuban salary is maybe ten or twelve dollars and that's how much it costs to buy a cd so they have know real cd market and there is no real commercial success. I think that is what has helped keep Cuban hip-hop in the true essence of what hip-hop is and was about but I agree with you, I think that you can get a lot of money from hip-hop and that has corrupted hip-hop in the United States and we all know that. They have less money in hip-hop over there so it's less corrupt. MVRemix: Which is interesting because my question then is, do you think that if Cuban Hip-hop had as much money as Hip-hop in the states, do you think that would change the dynamic, because M-1 was saying he saw examples of DMX, Snoop, and everybody else who is in the mainstream. 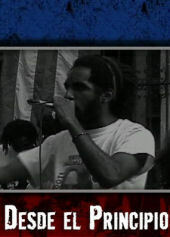 Do you think Cuban hip-hop would take a turn or do you think they would stay political even if the money was involved? Diaz: Well since it's a two-parted question I'm going to hit it in two different ways. The part about M-1and it's really interesting because M-1 doesn't speak Spanish, he speaks a few words maybe but he really doesn't speak Spanish. So when he says he saw examples of DMX and Snoop and all of that, I think he was more talking about their style, delivery, their persona, and their image, I don't think he was talking about their lyrical content. There are some artists there who are mixing up words but don't have a very direct message, but in hip-hop their looked down on a little bit more I can't think of any specific examples but there are artists there that don't have targeted lyrics like the biggest artists there. The bigger artists will say when you get on stage in Cuba it's to see how hard you can come and how real your lyrics will be they judge you on that a lot there, but it was a really good question about the money factor because I think there is know way to tell because it is hypothetical. But I think definitely that there is a strong possibility that no they would not have the same lyrical content because in my interview one of the reasons they say they don't rap about cars or money or drugs is because they don't have those things and they are very forward about that. They reflect their reality and if their reality changes I think their lyrics might change to. MVRemix: They say the radio stations do a lot of censoring of the music so what is played on the radio currently? Diaz: Well they do play hip-hop songs don't get me wrong, I've sat in on sessions on radio programs in Cuba and they play I would say, I don't want to say the majority but they play a lot of hip-hop songs of the ones of the major artists there have recorded. It's just that they do limit some of them its not like you won't hear any of the songs that you would hear at your average concert, you would hear some of them but they just censor or cutback on the ones that are more targeted at a specific part of the government or something. For instance, one of the songs that the group Obsesion (Obsession) did that was really about racism and how it plays out in Cuba and they wouldn't promote that particular song but you will hear a lot of other Obsesion songs that have political tones. It's not like every song, but they do screen every song, but they do let a lot of the songs come out but there are some that they don't but its hard to tell because some songs are really radical but I don't know exactly what their looking for whether its in the delivery and that kind of scares them off and they say maybe we can't put this on the radio. MVRemix: I guess getting deeper into the lyrics, what exactly are they asking for to stop besides the poverty and other things? What exactly do they want to change with their government and society? Diaz: Right! I know that M-1 says I would love to live in Cuba but even when he says that I don't think he wants to be there forever. Everyone is frustrated with what they have and they just want to move it forward and improve on it. I think in Cuba what they are trying to move forward with and build with is even much closer to have than what they have for instance someone here. MVRemix: Following up with that I would ask, with Castro's position in the air because of his health do they see or for see any changes that would better their society because of that, or do they think because his brother is coming in to take his shoes that its basically another Castro doing the same thing? Diaz: I don't think anyone will be able to lead Cuba in a powerful way as Castro did I mean because he's led this country longer than any other leader in the world. The way people view Castro is like most of the people there feel some kind of love for him or some kind of admiration for him. It's different than President Bush because there are so many households full of people that don't believe in any of that and with Castro's position there are so many people that feel indebted to him you know like the very old Black Cubans were illiterate until he had his program go into the countryside and to teach all those country folk so to speak how to read, and how to write. Those people will never forget that and those people were changed with the revolution and the fact that Castro led that puts him in a completely different position and if he steps down without a doubt I think there will be some changes, I don't know exactly what they'll entail but he's just a powerful leader and without him leading there is bound to be some give because no one can lead the exact same way another person did. Cuba is one of the poorest countries but it also has some of the best educated people in the world. I mean when you have an educated population like that, I mean their brilliant more educated than the average American. The Cuban people and the Cuban government will be fine if we let them design there own future. If we step back and when I say we I mean the US and let them figure out what they are going to do for a transition I think they will be fine because they are so educated but if we step in they will resist and they will resent the US. MVRemix: In the states who do the Cuban artists admire or look up to because I know in Cuba they have their own type of style and way of life, so is it the US has their own thing and they do what they do and in Cuba we do what we do? Diaz: There is a part in the film that talks just about that because some of the Cuban artists have come to the US as delegation as hip-hop artists from Cuba. I would say for the most part people in hip-hop in the states have been affected most by the people that come to Cuba like Common, M-1, the Roots, Aceyalone, and Paris from the Bay Area went there, Tony Touch went there so I think its like anywhere you see someone in concert or you meet them you feel their art and music in a different way because you have a more personal connection. Now the artists that happen to go there happen to be more align with the artists in Cuba and the principles that Cuba upholds. The artists who came to Cuba they were great, they showed us their style of hip-hop which is more align with our style but it was frustrating to come to the US because their understanding of hip-hop doesn't mean the same thing it meant 30 years ago and they see the people in the videos and with their I don't know gang attire and the cars and the women and it frustrated them to see that and say that so far off from where we are with our music so its. So I think they recognize there are certain artists that steer away from that side of things but they've come to accept it as US artists have their reality in today's world and we have our reality in today's world and so we act and write our lyrics accordingly. So that's kind of their take on things. For more information go to: www.myspace.com/cubanhiphop where you can also observe the trailer. "They reflect their reality and if their reality changes I think their lyrics might change to."